Rebecca Niederlander is a sculptor and installation artist interested in revealing cosmic truth. Through contemplation, and a thoughtful manipulation of materials, Niederlander perceives clues to the subtle mapping of a larger order. The artist uses these hard-won insights to construct a new way of communicating – a new visual language. A St. Louis native, and graduate of both UCLA and CCA (California College for the Arts), Niederlander works out of her Eagle Rock, California studio. Her work has been exhibited internationally, including a group show of Los Angeles artists at the 2015 Venice Biennale. KN: Have you always thought of yourself as an artist? When did you first start making/creating?RN: Yes, I have always thought of myself as an artist. It is in the way I approach the world, and the way I communicate within it. When I was seven years old I won a coloring contest and received a seven foot tall stocking filled with toys. I have always been a maker. I realized early that my way of seeing the world was actually different than many people. That has been a good thing, and a hard thing as well. Being a creative professional involves finding ways to communicate in the internal language one has. Community is created through communication, and having spent my entire life sorting out the best ways to do such. KN: I discovered in an artist statement about your work that you speak of “interrogating the materials lovingly.” How does this thoughtful interrogation lead to an artistic breakthrough? RN: I consider myself a materialist in the truest sense of the word. I look at materials as a significant part of conveying whatever the specific message is for a given work. Certain materials, like paper, give a very intentional read to a work, while steel, obviously, will lend itself to wildly different reads. History, context, one’s particular experience with a material, all play a tremendous role in the connection made between an artist and their viewer. I take that connection to heart in the initial stages of developing a project by working a material and putting it through its paces. I’ve had projects that I think will work really well in a particular medium, only to discover through exploration that something else is significantly superior. KN: Your newest series incorporates the use of salvaged wood pieces adopted from wood workers’ shop refuse piles. As part of the works, you interview the maker about their process, and explore how the intent of the work is imbued – even absorbed – into the cast-off material. Can you describe this series a bit more? RN: The current series involves making pilgrimages to wood-workers shops, and interviewing them about their spiritual practice, after which I take their scraps and combine them to make new sculptural works. I also have a degree in journalism, and have extensive experience with interviewing and human-interest stories. My interviews are off the record, and completely about honoring the particular experiences of the wood workers. Anyone involved with a particular medium, and I’ll go out on a limb here to give a special shout-out to those in the designated craft mediums, has a particular fondness of their medium which has a lover’s-type relationship to it. They have grown with it, and understand it in the way an old couple does. As someone who varies their medium over my own decades as an artist, I wanted to find a specific path to exploring the ways these creative professionals might have a spiritual connection to their material. I am deeply committed to the idea that we are all in community with each other, and to finding the connection that creates the ability to be an empathetic person and a part of any community. By honoring these people and the soul/ghosts of their work, and then honoring their scraps/trash/discards, and then creating new communities through the assembling of cast-offs into new and exciting works, I am visually describing what is possible for each of us when we connect with another. Each of the sculptures in the series is totally unique. 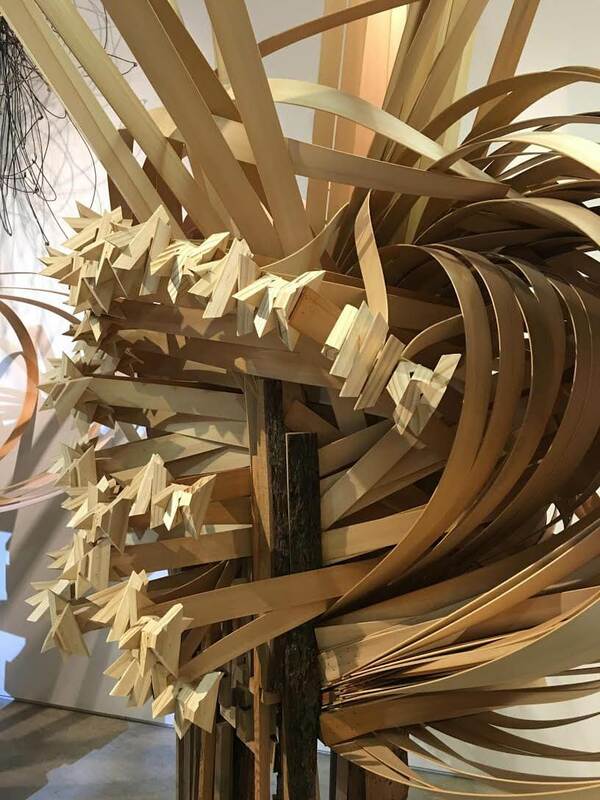 They are connected by the materials, and my manipulation, but part of the rubric is that I can not alter the wood. No cutting is allowed. Thus each element becomes a part of an unknown puzzle that must be solved in my studio. I see interacting with other people in the same way. Each connection is a puzzle to work out. Katie Nartonis is an art historian who specializes in West Coast Art + Design. As writer, curator, designer and film-maker Nartonis endeavors to tell untold stories of the artists and makers whose work contributes to the fabric of the larger California art scene. She serves as Art + Design Editor for SoCal Magazine.